01.With a foreseen continuation of transformation in environmental and the changing dynamics of the way we live, the landscape is imposed with pursuing mechanisms that can accommodate the transformation of economic, social, environmental and infrastructural condition of the urban fabric. How can this transformation and create a set of systems determined by the investigation and redefinition of the urban fabric that can facilitate change and accommodate a flexible accumulation and produce a changing spatial urban pattern? The possibility exists to utilize and develop notions of indeterminacy and self-organization in a fabric that facilitates the urban landscape to emerge as a set of systems operating under dynamic, temporal and fluctuating conditions. This then constructs a set of circumstances that enables us to discover how the nature of the urban landscape can be transformed into a formless, dynamic and complex condition, where the indeterminate nature of landscape is offered as a replacement model of order. It suggests a shift from an ordered and rigid fabric, to a set of systems that emerge from an existing context, allowing access to a new form of urban! 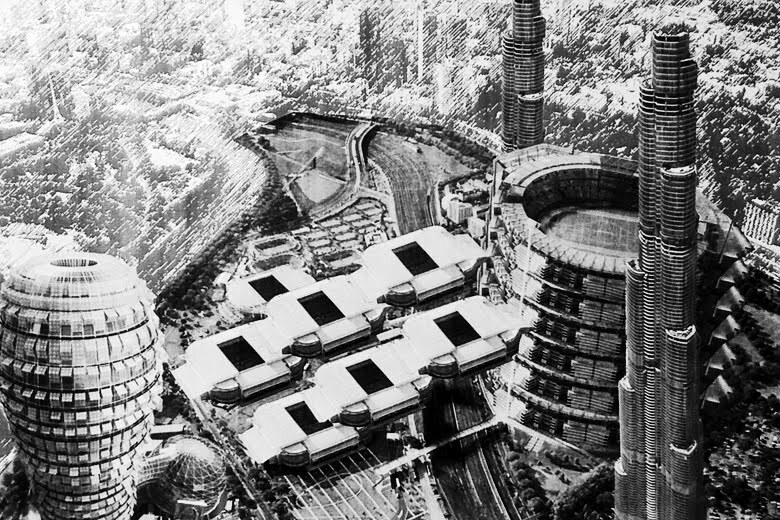 02.By looking at the contemporary case studies on megacities, such as Lagos in Africa or Shanghai in china the idea of city as a vast surface in which architecture, infrastructure, and landscape are considered as an undifferentiated plane subject to the same forces. Alex Wall discusses a surface which has the ability to support and connect a diversity of systems/activities in time. The studio puts forth the idea of the city as a horizontal phenomena which can measure and order what it exists within. Wall utilizes the term landscape as means for describing the city as an active plane which ‘organises and supports a broad range of fixed and changing activities’. Landscape for the studio doesn’t conjure up images of natural idyllic or recreational spaces but implies a performative ‘connective tissue’ that organizes not only the objects and spaces of the city but also the complex systems, dynamic processes and events that move through them. The aim of the studio is to develop different landscape logics of transformation which can accommodate the unpredictable future of the city. The developed models will be responsive & robust. These speculative models of the future will transform not only itself but the site at many scales where time is an embedded material condition. OUTR collaborators: Bridget Keane, Craig Douglas, Armando Oliver and Greg Afflick, Joseline Setiawan, Carlie Young, Kathryn English. Industry Collaborators: Arup, Kwodrent (Singapore), Karres en Brands (Hilversum, Netherlands).